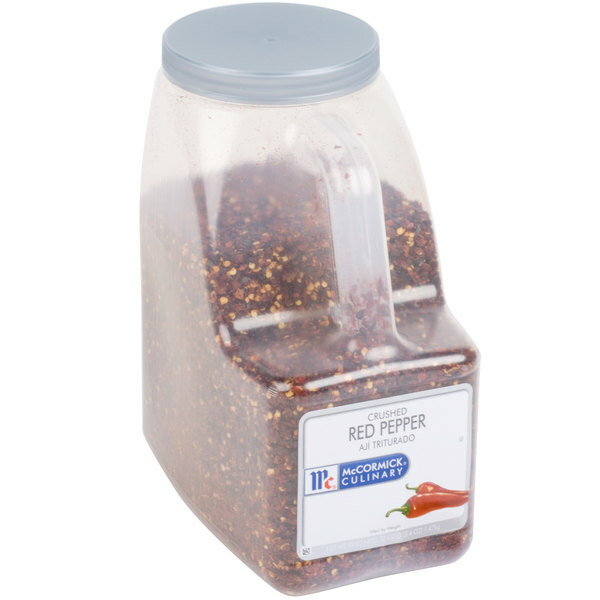 McCormick Crushed Red Pepper - 3.25 lb. Regal Bulk Crushed Red Pepper - 4 lb. A staple in every pizza parlor, McCormick crushed red pepper is often found alongside garlic powder, parmesan cheese, and other standard pizza seasonings. Derived from the same species of pepper as the cayenne pepper, crushed red pepper comes from the dried pods within the pepper. Hot and flavorful, this flaky, red and orange spice includes the pepper seeds for even more texture and flavor. The seeds intensify the heat to add a zesty, flavorful kick to anything you make! Use crushed red pepper to spice up soups, marinades, and cheese sauce. It serves as a delectable counterpart to creamy dishes and curries. Commonly found in spaghetti sauce and pizza sauce, you can also sprinkle it on omelets or in zesty Italian dressings! 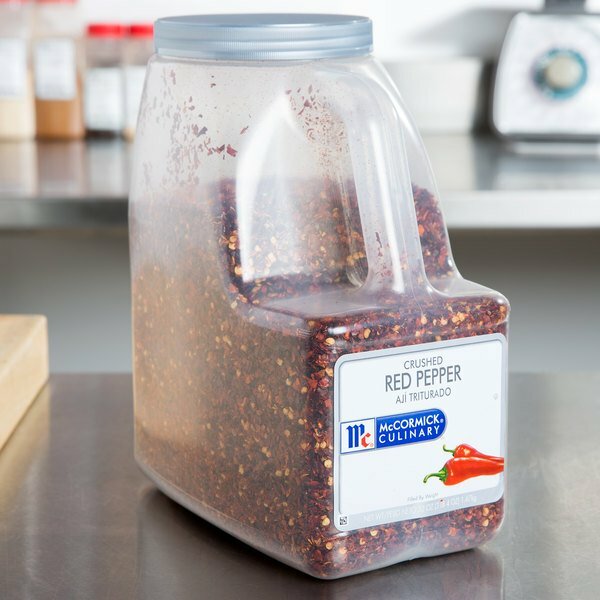 Note that a small amount of crushed red pepper will go a long way; it is recommended that you use no more than 1/4 tsp. per 4 servings of the dish you're preparing. McCormick is a name you can trust to deliver high quality spices every time. Compared to bulk bags, this 3.25 lb. container provides a good supply of product and is easily accessible for your cooking and seasoning needs. Use McCormick to create and enhance masterful flavors in all your best dishes. Overall User Rating: McCormick Crushed Red Pepper - 3.25 lb. McCormick is a well known brand in the spice industry! They do cost a little more, but, one pays for excellent quality! And, Webstaurant store has the best prices! Get it from here! Four stars! Nice quality crushed red pepper flakes. Make for a great tasting pizza. Great for sprinkling or adding to dishes. Great quality pepper flakes from McCormick'. McCormick always has such high quality and this crushed red pepper did not disappoint. It adds just the right amount of heat to meat and vegetable dishes. The McCormick crushed red pepper flakes are wonderful and perfect. They are bold and make a great addition to our pasta salads. The jug is wonderful and has a nice sturdy handle. McCormick is a staple in my kitchen. I always trust that their spices are going to be fresh and tasty. This amount of red pepper flakes will last forever. I am a long life fan of the quality herbs and spices McCormick offers. Their red pepper is great and is perfect on our pizza.